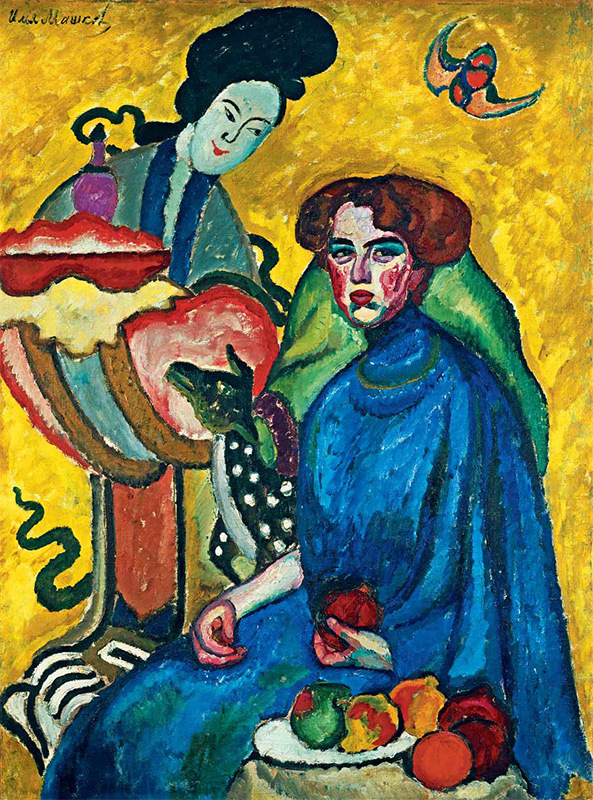 The Tretyakov Gallery holds a portrait of Yevgenia Ivanovna Kirkaldi (“Lady and a Chinese Woman”) made by Ilya Mashkov in 1910. One of Mashkov’s most beautiful works, it has featured at numerous exhibitions, appearing first at a show of the “Jack of Diamonds” group in St. Petersburg in 1910, and is well known to both the general public and to art experts. However, next to nothing was known about the sitter. 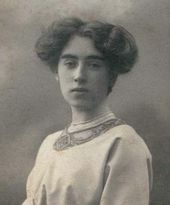 Today, thanks to Kirkaldi’s granddaughter Anna Kirillovna Bystrova (nee Snesareva) we have photographs and biographical information about the female student of Mashkov, who for a time was also one of his favourite models. The origin of Yevgenia’s surname is of special interest. “Kirkaldi” in fact owes its “Italian” style to the peculiar spelling of its English original: Yevgenia Kirkaldi’s ancestors came from Scotland (where a town has a similarly sounding name, Kircaldy). They were pious, Godfearing people who visited church often, and their life style gave birth to their family name — it originally sounded like “Church all day”, the root of which is the Scottish word for church, “kirk”. Later the family moved to Germany and the pronunciation changed. Yvgenia Kirkaldi was born in 1889 into a merchant family, her father, John Kirkaldi, a German subject and a merchant in the Third Merchant Guild who sold tableware in Moscow. The family rented an apartment in Maly Kiselny Lane. Yevgenia’s brother George Kirkaldi was a merchant and a bicycling champion of Russia. It is believed that Yevgenia enrolled at Mashkov’s studio in the late 1900s. 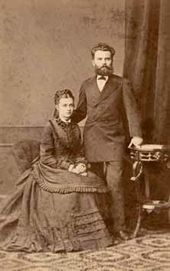 In late 1910 or early 1911 she married Andrei Petrovich Snesarev, an associate professor of chemistry at Moscow University. Andrei’s father for many years worked as a manager of Khan Giray’s land holdings in the North Caucasus, and the newly-wed couple often summered with him. In 1912 they had a son, whom they named Kirill, who is alive today. Later Yevgenia received an academic degree in philology; she knew three foreign languages (English, German and French), and worked for many years at the board of Soviet state-run hard-currency stores (Torgsin), and then at the International Trade Board (Vneshtorg). According to Anna Bystrova’s memoir, her grandmother, who died two months before her hundredth birthday, even in old age kept her good memory and read books in foreign languages. 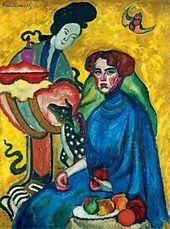 However, she never resumed painting after her marriage and rarely talked about her past experience in the arts; the family does not hold either any of her works created under Mashkov’s tutorship, or her journals or any other documents with her recollections about that period. For this reason, today it is difficult to say exactly how long she studied at Mashkov’s studio, or why she chose his studio at all. At that time Moscow had many art workshops, and probably what accounted for her choice was the proximity of Mashkov’s studio to the Kirkaldi family home. At least one thing is known for sure — that after her marriage, i.e. 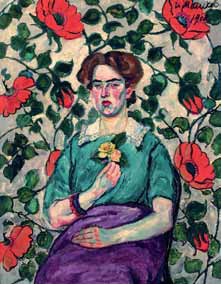 since 1911, Yevgenia did not attend classes in Mashkov’s studio. We can guess the date when she joined the classes by comparing the three portraits by Mashkov. They include the above-mentioned work from the Tretyakov Gallery, as well as “A Woman’s Portrait (against wall-paper background)” from 1908, now held by the National Art Museum of Belarus (Minsk), and “A Woman’s Portrait. Head. (Kirkaldi? )” made in 1910, from the collection of the Viktor Vasnetsov and Apollinary Vasnetsov Regional Art Museum in Kirov. The woman’s portrait from the Minsk museum is listed in the gallery’s accession book as “Portrait of the Artist’s Wife”. It is supposed that this work entered the collection of the Museum in 1924 from the then abolished Vitebsk Museum of Modern Art — this is proved by the fact that the catalogue of the Vitebsk Museum included two Mashkovs: “Still-life” and “A Lady”3. However, the entry in the book was made much later, in the 1960s, and currently art scholars from Minsk question it,4 as it mentions Mashkov’s first wife Sofia Stepanovna Arentsvari. But the artist’s legacy includes few portraits where Arentsvari can be definitely identified as the sitter. 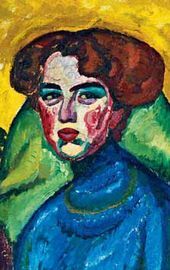 Bolotina’s book5 contains a reprint of Mashkov’s picture “Woman in White” made in 1904, which, according to Maria Mashkova, represents Sofia Arentsvari, although the sitter’s facial features are quite indistinct. Another portrait in Bolotina’s catalogue is dated 19096 but the image is not reprinted and information about its size, current condition and whereabouts is missing. 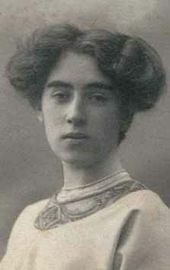 Regrettably, no photograph of Sofia Arentsvari is known to exist, thus making any comparison with the sitter in the Minsk portrait impossible. The archives include some information7 about Sofia’s brother Viktor Arentsvari, a student of the Moscow School of Painting, Sculpture and Architecture, and her sister Valentina. 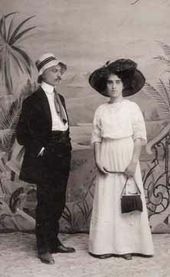 Valentina Stepanovna Arentsvari was an actress, who worked in 1907 at a private theatre owned by Fyodor Korsh, and later at the Maly theatre. In 1919 she emigrated with her husband Yasha Yuzhnyi to Germany, where she performed with the celebrated “Blue Bird” (Der Blaue Vogel) cabaret, founded by Yuzhnyi in Berlin in 1920. Some of Valentina’s theatre photographs survive, but in them she appears to be wearing makeup, and it is impossible anyway to say how much she resembled her sister in appearance. However, the opportunity remains to compare the portrait from the Minsk museum with photographs of Yevgenia Kirkaldi, as well as the two other portraits mentioned above. 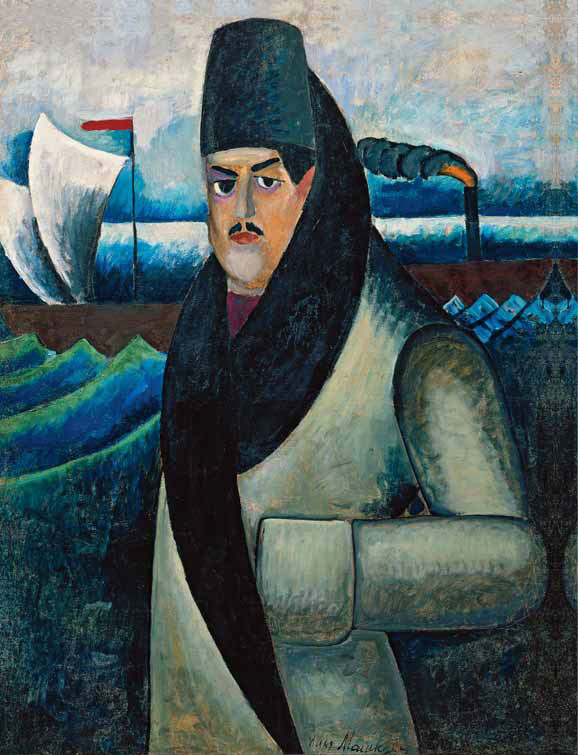 In 1908—1910 Ilya Mashkov created a whole series of portraits. Apart from his wife, he often portrayed his friends and his “companions in art”, some of the sitters being his students. The three portraits in question were created at nearly the same time and in a similar style. Mashkov’s works of that period are distinguished by their bright backgrounds, richness and intensity of colours, decorativeness and use of Oriental motifs. Comparison of these paintings with photographs of Yevgenia Kirkaldi brings out a portrait-like resemblance. The artist painted a different background while recreating almost exactly the same turn of the figure and set of the head, as well as the combination of the blue of the clothes and an amber hue in the hair. The facial features, the curve of the eyebrows, the shape of the eyes, the lines of the mouth, and the hair coiffed in lush waves look very similar; this similarity is obvious in spite of the deliberate “daubed” quality of the sitter’s face and the fact that in these portraits she looks much older than her age. At that time Yevgenia Kirkaldi was only 19, and in the photographs she looks very feminine and young, whereas in Mashkov’s portraits she is depicted as a middle-aged lady. It is impossible to tell whether Yevgenia liked her painted image. But it is perfectly clear that Mashkov himself liked the painting, and he painted Kirkaldi much more often than he did Sofia Arentsvari at that time. Maybe Yevgenia was a very good sitter, or perhaps she was the type of woman that then attracted him most. Thus, comparison of the images allows us to reach the conclusion that they feature one and the same person — Yevgenia Kirkaldi. 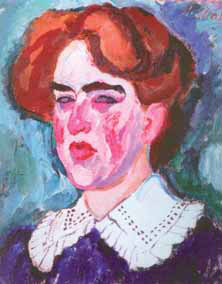 Because the earliest of the reviewed portraits was created in 1908, it follows that at that time she was already studying at Mashkov’s studio, since there is no evidence to suggest that she could have met the artist under any other circumstances. The author expresses her gratitude to Mrs. Anna Bystrova for the information provided and the family photo-archive. Bolotina, Irina. Ilya Mashkov. Moscow, 1977. P. 291. Viktor and Apollinary Vasnetsov Kirov Art Museum. Moscow, 2003. P. 44. Russian Avant-garde. Interpretation and Representation. St. Petersburg, 1998. P. 42. The author wishes to thank Tatyana Reznik, Head of the Department of Russian Art, National Art Museum of Belarus, for the information provided. Bolotina, Irina. Ilya Mashkov. Moscow, 1977. P. 282.